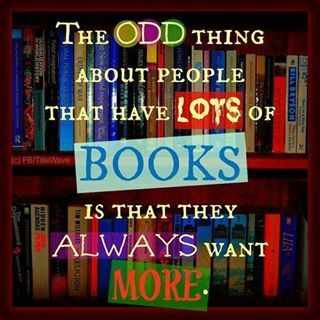 12.31.13 The thing about books……. Roy gave me my Kindle as a Christmas gift two years ago. I now have over 100 books on it with new ones added each week if not every day. Having never had enough time in my pre-RV life to sit down and enjoy a good book, reading is now on the top of my list of things to do while also getting some resting time. Back in my pre-RV life I picked mostly sappy romance stories and particularly Christian romance novels. Now my range of literary likes go from romance, mystery, murder, espionage, southern tales, science fiction, and fantasy. Sometimes I get stuck on the undercover operations world and can’t get into any other if there is another of that type novel waiting to be read. I remember wanting to be a spy when I was younger so perhaps I’m vicariously living out this unfulfilled desire through these novels. My new favorite writer is John Gilstrap, especially his Jonathan Grave series. He writes about the dangerous world of hostage rescue operations. His writing style, development of his characters and the exciting life and adventure of his main character kept me from putting each book down until I was finished. I’ve read everything he’s written and can’t wait for his next novel, END GAME, coming out next year. After exhausting all John Gilstrap had to offer I found another writer of somewhat similar undercover operations type novels named Brett Battles. They are almost as good but he switches around so much in his writing from one situation to another that I have to think very hard to keep up with the storyline and who is doing what. It all ties in near the end but getting there is rough! If you know anything about my brain holes you’ll know this is hard for me to do. I’d prefer a much easier to follow storyline. I do think that reading is good exercise for my brain which justifies my reading habit somewhat! I just asked for reading recommendations from my facebook friends and got a lot of great responses. None of which I’ve read so I now have a new reading list heading into 2014. At least after I read the 4 books I just got on Amazon today……..
There’s something about a book or book series that is set in a made up world like Hunger Games, The Host, Twillight that really catches my interest. The writers of these novels certainly don’t have holes in their brains or maybe the unique ideas they come up with come out of the holes! In case you don’t know what I mean by holes in my brain, that’s just what I call them. I have dead spots in my brain caused by having multiple TIAs (Transient Ischemic Attacks or mini-strokes). While I now take medicine for my memory and to help prevent more TIAs, I can usually tell when I’m in a hole and only hope that the next thought will help me climb out. I’ve also learned not to get into a book series unless all of the books in the series are already published. I got all wrapped up in an Amish series that hasn’t ended and am now stuck wondering what will happen after the second book. This series is The Divine Secrets of the Whoopie Pie sisters – An Amish Christian trilogy by Sarah Price and Whoopie Pie Pam Jarrell. Book one and two were so good but when I read book two in October of 2013 I realized the third book won’t come out until end of this January. I don’t do waiting too well! Roy has very little interest in reading so he’s not really sure why I love it so much but he knows it’s either I read or I talk to him all the time so he’ll vote for me reading all the time! My Bible in both New Living Transalation and New American Standard versions are both on my Kindle. I find it easier to find scripture in my paper Bible in church so the Kindle is just used at home for Bible study. My very favorite books of all times are not on Kindle and it’s such a loss to all who would just love them. The books are “Papa’s Wife” and “Papa’s Daughter”. The part of the book I will always remember is that Mama would polish each of her children’s shoes every Saturday evening, in preparation for going to church Sunday morning. She’d think of something each child did that week and say a special prayer for each one as she cleaned their shoes. This impressed me so much that even though I didn’t have as many children as she did I always cleaned my two son’s church shoes each Saturday night and pray for them then. I read a review which kind of gives a summary of the book and why it is so beloved. “Set in Sweden, an eighteen-year-old girl comes to work as housekeeper for the parish’s confirmed bachelor pastor, and determinedly sets out to marry him. 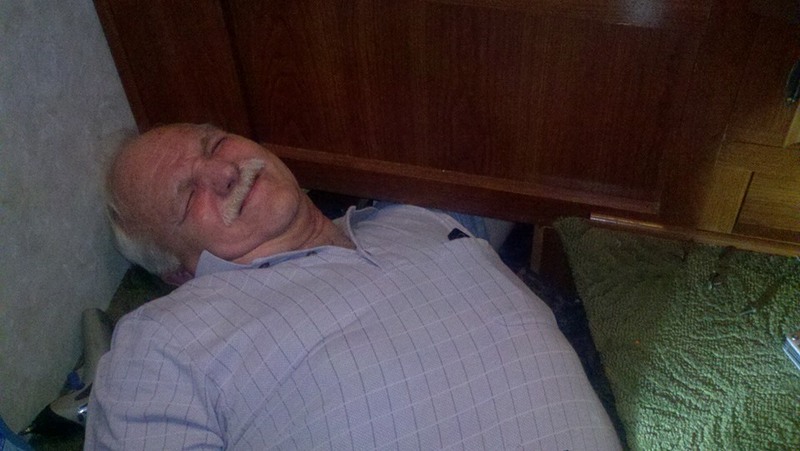 With head still spinning, the newly-married man of God finds his life (as well as his lovely home and fine furnishings), turned upside-down, often with hilarious results. As their family grows, so does Maria’s determination to move them all to America with which country she has fallen in love. A wonderful, amusing love story, and proof-positive that once a woman has made up her mind, it is best to capitulate right away. An amusing novel which shares the ups and downs of family life, complete with it’s joys and sorrows, founded on faith and love. A definite “warm, fuzzy-feeling” kind of novel”. Books can open our minds to the world ….. Happy reading to everyone! Ya’ll come back now, ya’ hear! 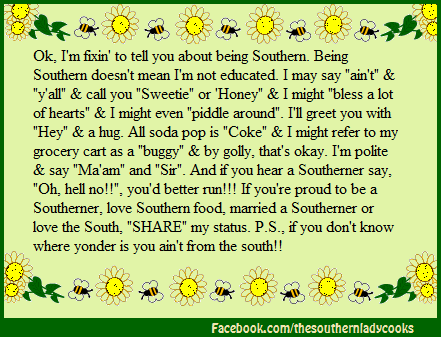 12.29.13 I am a Southern girl no matter where we travel! 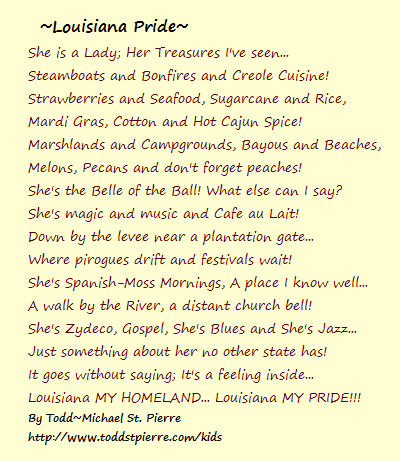 I am a Southern girl, born and raised in New Orleans, Louisiana. 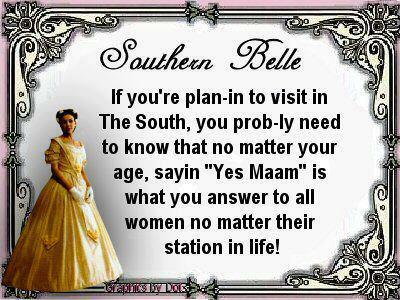 No matter where our travels take us I will always be a Southern girl. 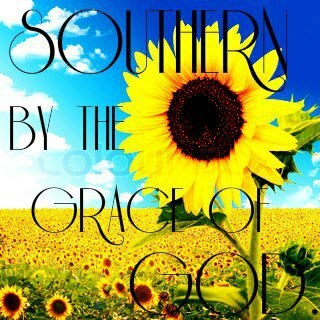 I feel truly blessed to be Southern by the Grace of God! Traveling has emphasized our southern uniqueness to me and the graphic quotes below share some of our uniqueness so I’d like to share them with you. Everything about this short piece encompasses most of what is near and dear to our Southern hearts. This is soooooo very true. Cajun food is not hot spicy food, it’s cooked with a lot of love, cooked slow, most always a ROUX and perfect full bodied seasonings. 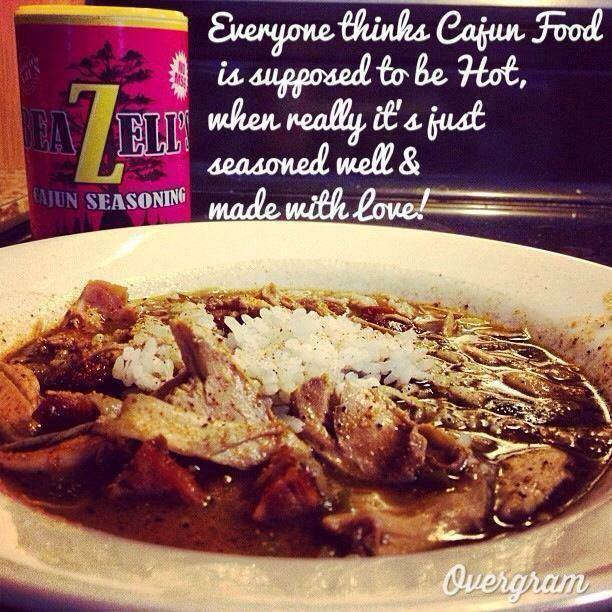 Cajun food cooked elsewhere is usually just so spicy hot you can’t breathe, but not true southern cajun food! Crawfish in Louisiana is the best comfort food you can imagine. A wonderful afternoon spent eating (and yes I mean all afternoon) around a big table with either a hole in the middle or a big can nearby for your crawfish shells. Tables piled high with crawfish, ears of corn, potatoes, mushrooms and whatever else your family likes to boil with the crawfish. Nothing tops this! No this is now how we learn our ten commandments. 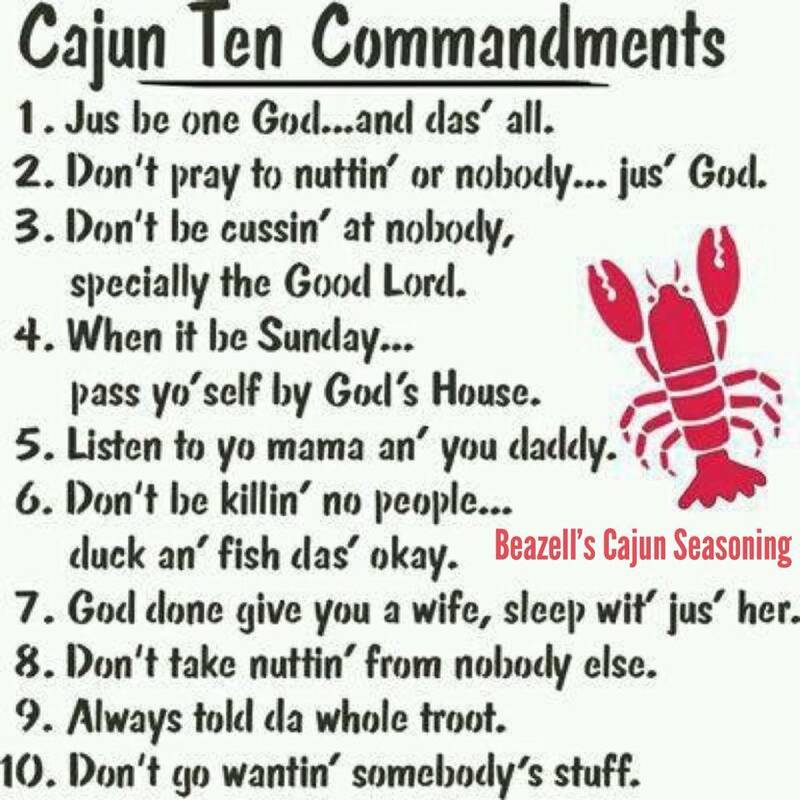 Those are learned from the Bible but this is certainly a perfect cajun way to describe them. 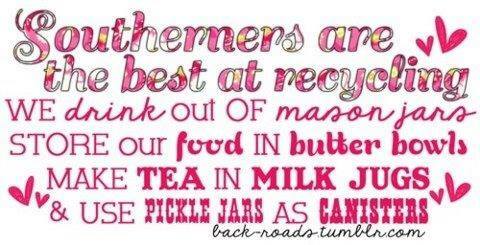 Us Southerners are big people because of this. If someone is sick, you feed them. if someone dies, you feed the family. If a friends relationship breaks up, you bring them food or take them out to eat. If someone does something great, you have a party with food. If nothing is happening you create something by cooking and inviting family or friends over. Every aspect of our lives involves delicious home cooked food. I’m a firm believer that Southern Baptists are the best at pot luck dinners that there is. 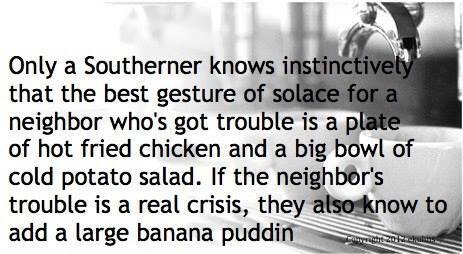 If you really love someone you bring them banana pudding! What can I say about this one, except it’s true! I believe I could write all day about this one but I’ll try to be brief. 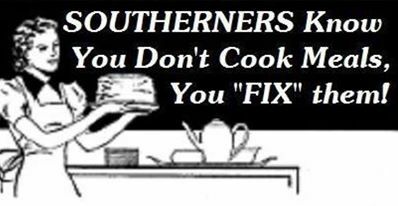 Southerners don’t realize that fixin is not a term that other folks use and certainly can’t imagine why they don’t understand it. I’ve been fixin food, fixin to leave, fixin to go to bed, fixin to go to work, fixin to go to church and fixin to dozens and dozens of other things all my life and never ever thought it was odd. Fixin means either “getting ready to” or “I am cooking”. And why we say it, I don’t know. 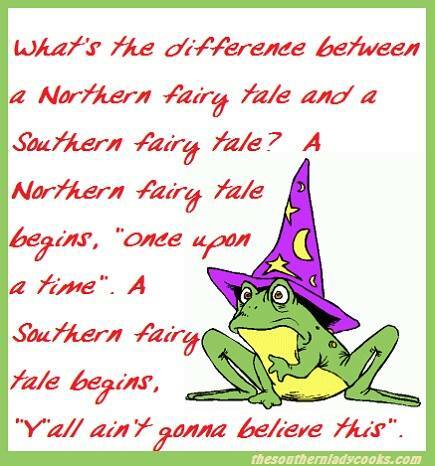 Southern language can be a lazy language and somewhere back when someone must have started to say that one word instead of the three words and it stuck. My hometown is New Orleans Louisiana but I’ve spent most of my adult life in Hammond, Louisiana. 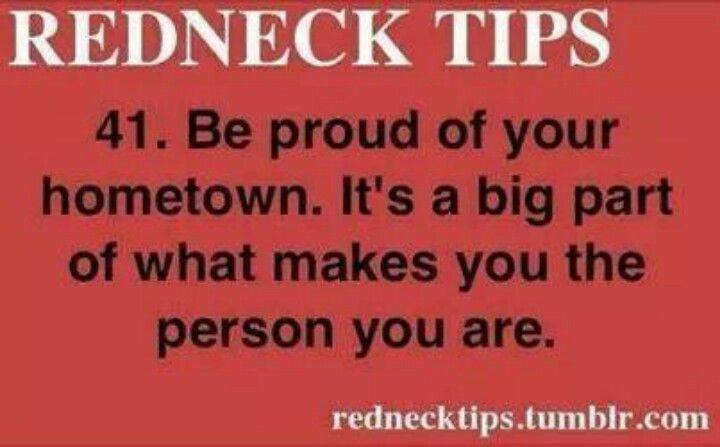 I’m very proud of both places and they are each definitely part of what makes me the woman I am! Mama always taught me to say “Yes, Mam” and “No Mam” and the same for men except for saying Sir. She explained to me that regardless of someone’s age I must always say those things to show respect. Sometimes others tell me I don’t need to tell them that, especially younger folks, but I still do cause my southern Mama told me to! 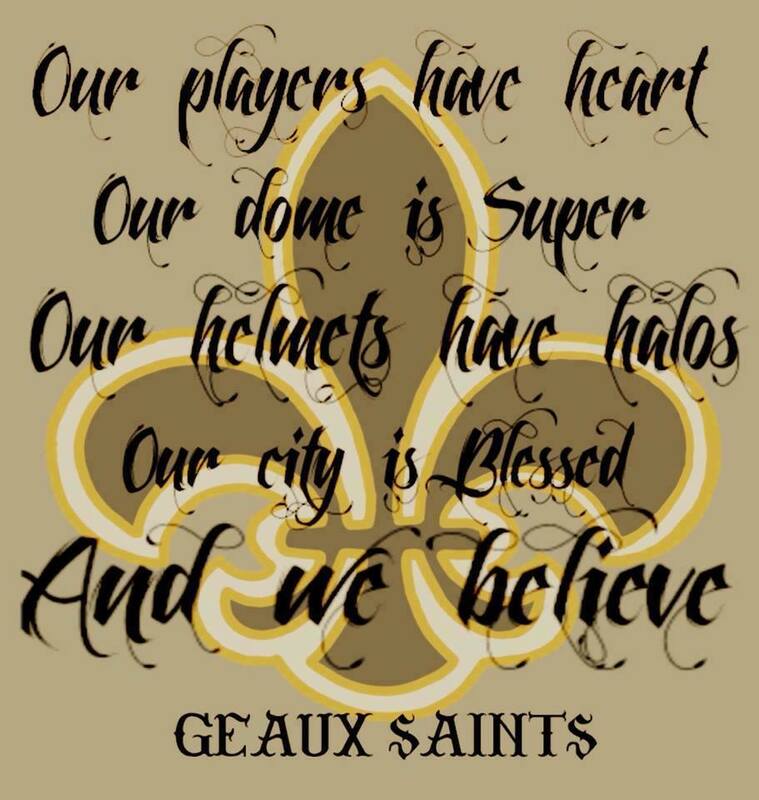 The New Orleans Saints are the heart of the City of New Orleans and all of the State of Louisiana. 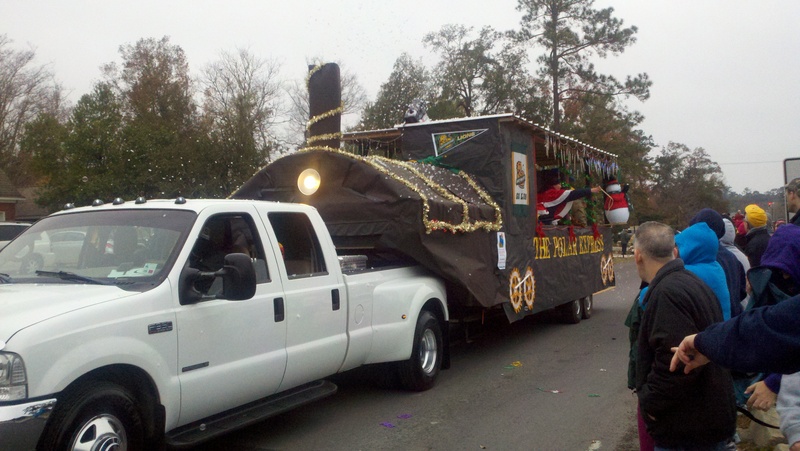 I’ve unfortunately wanted to beat folks as we’ve traveled if they had something negative to say about the Saints. 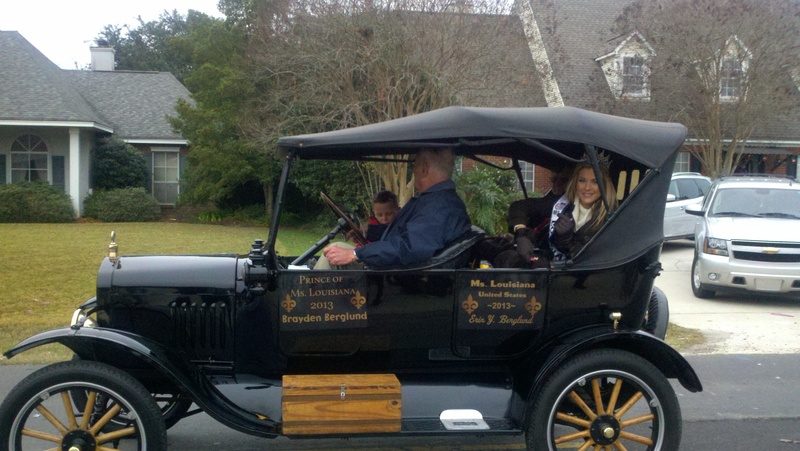 Being the southern lady I am I held back! 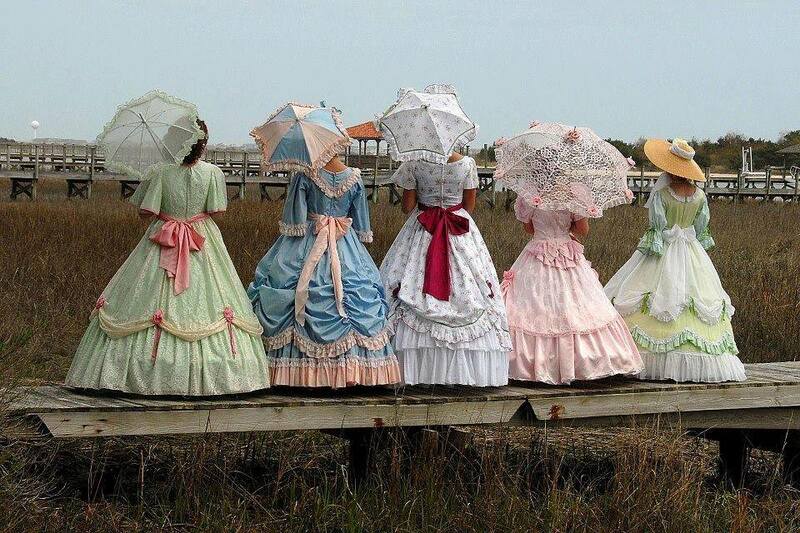 No I’ve never ever worn one of these beautiful Southern dresses but when I see this I’d sure like to pour myself a cold glass of iced tea and sit on a porch somewhere rocking for a spell! I see nothing odd about any of this. Doesn’t everyone do this! I will take this thought with me as we get back on the road. We’ll still be in the Deep South for a while in Florida, the gulf coast and out into the southern west. 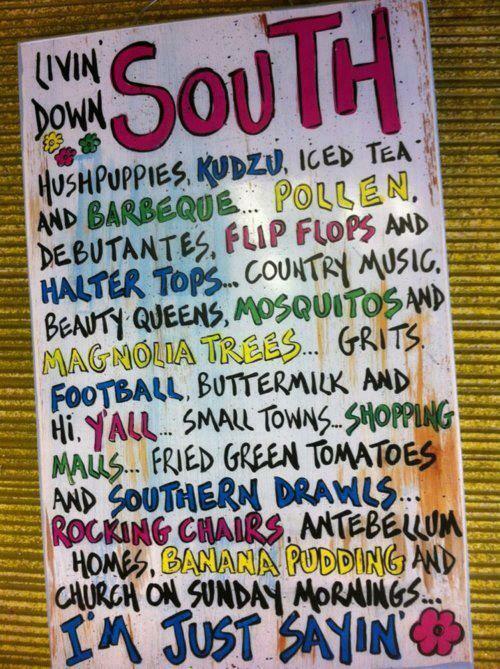 I look forward to seeing how truly Southern those other places are compared to my hometowns! 12.27.13 Waiting and waiting and getting back on the road soon! Waiting seems to be our theme lately. Roy’s been waiting and waiting and waiting to have his knee surgery. I’ve been waiting and waiting to have the MRI to determine the proper treatment for my neck and shoulder pain. Last Sunday Roy started running fever and got a lot of congestion in his chest. 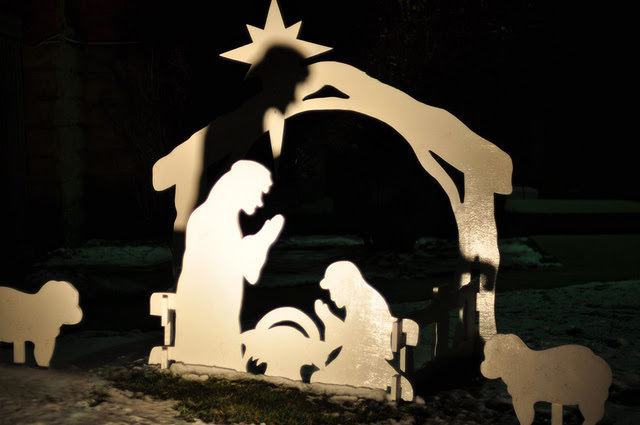 The fever stopped after Sunday but came back Christmas evening. 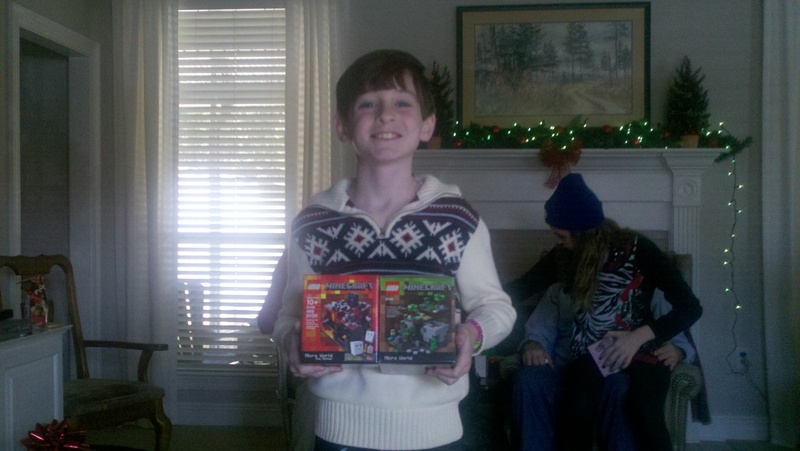 The day after Christmas we had his pre-op visit with his orthopedic doctor. Roy had several questions about the surgery and the doctor explained everything to him. I could tell Roy wasn’t real pleased or sold on the answers he got. The doctor prescribed Roy a strong antibiotic for Roy’s chest congestion and fever and said they could do the surgery if he was well by Saturday with no fever. After leaving his office Roy expressed his reluctance to have his doctor do the surgery because of the older methods he uses. When we got back home Roy shared some of his research with me on newer more minimally invasive techniques available. We agreed he wouldn’t have the surgery done here and would check out doctors in our travel who did the surgery like he wants. Again this means a whole revamping of our immediate plans. 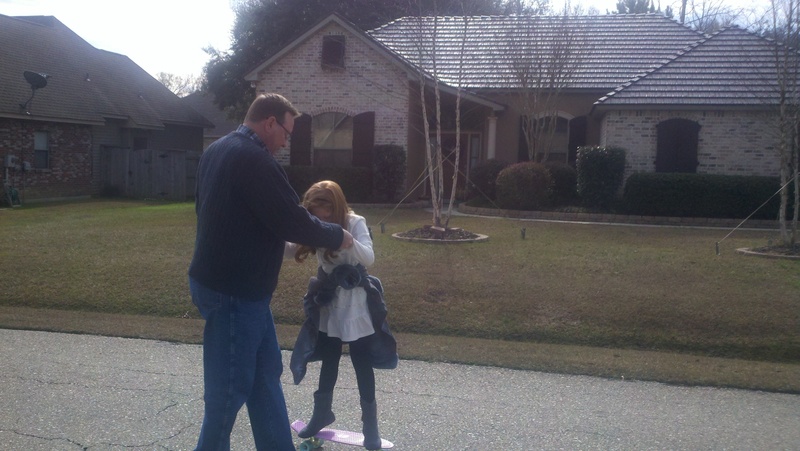 No surgery means no reason to stay in town and move to Punkin Park on Saturday for the month. 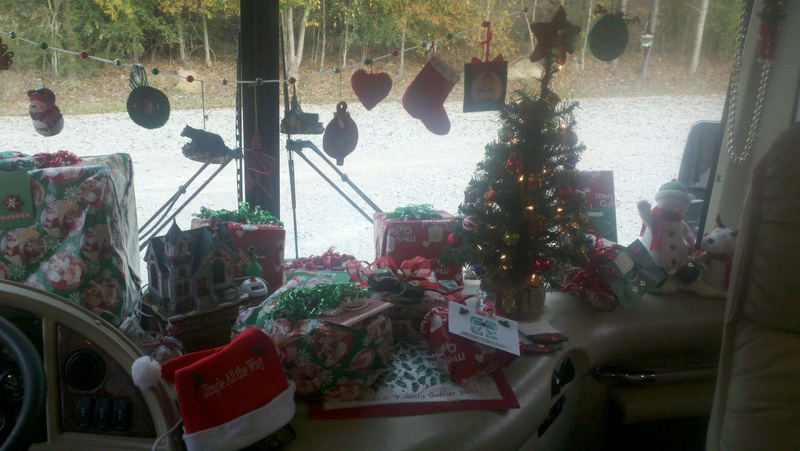 Our new plan (and there are always new and revised plans in RV living – which is something we are slowly getting use to, me being a plan driven person) is to stay at Berryland Campers until at least next Thursday when they open up again after the holidays. Roy has several computers to set up software on which he was going to do week after next, but now he’ll be doing it next Monday and Tuesday and possibly Wednesday. 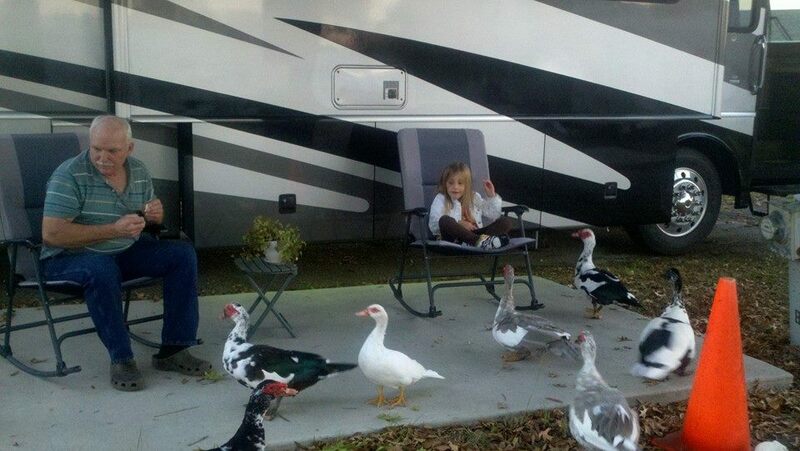 Once that work is complete we can move out for Florida where we will have some windows on our RV replaced. We’re also going to Disneyworld to apply for future jobs. It’s highly recommended that you go there to apply instead of doing it on line so we’ll go there and of course play a day or two at Disney while we’re there!! We’ve been getting hitch itch more and more lately so it’s great for us to have the opportunity to get back on the road. We have thoroughly enjoyed visiting with family and friends over the Thanksgiving and Christmas holidays and are thankful for this time to reconnect with our roots and enjoy being truly Southern again for a while. The extended stay has been difficult because everyone is at work, school or whatever all the time and there aren’t many places for us to visit like there is on the road. 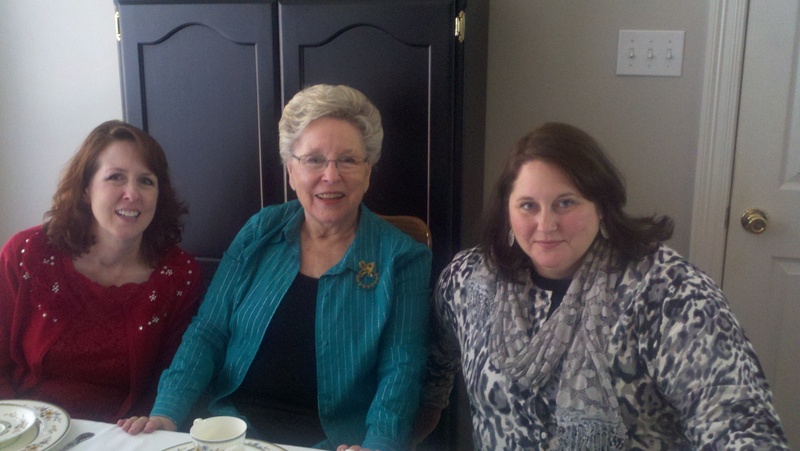 Christmas morning was spent with my sister Harriett’s family (Roy was home sick though) and that was quite a special treat. She and my brother in law George have her children and grandchildren over for Christmas breakfast after the kids open their presents at their own homes. She served quite a spread and I enjoyed the food tremendously but nothing compared to the joy of watching her children and grandchildren open all their presents as they exchanged gifts. 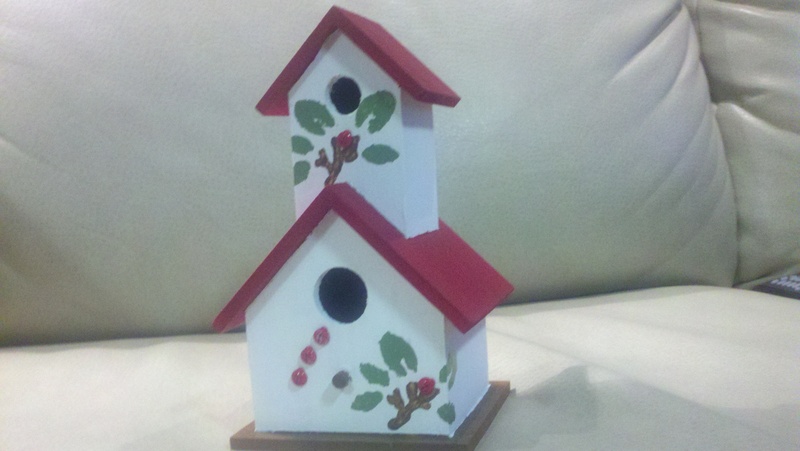 I even got some nice gifts including a hand painted bird house my sister Harriett painted for me. It will have a prominent place on our passenger side side mirror when we are parked. These precious memories, along with spending time with our son Chip and his family will hold us for a while once we get on the road. Once I get the MRI results next Monday or Tuesday I’ll know what the next step for me is. My orthopedic doctor said that probably it will involve a shot in my neck to calm down the spasms and inflammation caused by the bone on bone in my vertebrae. This shouldn’t delay us getting back on the road by more than a few days so by the second week in January we should be heading out on our adventures. We both miss the traveling and seeing new things. I’ve applied for several state park and federal park jobs in New Mexico, Texas, Oklahoma, Arizona and Nevada so hopefully by the time we’re finished in Florida one of those jobs will become a reality so we’ll know where we’re headed then! I don’t think I said in previous posts that I only made it through one week of working at Textbook Rentals. The work involved a lot of lifting heavy books over my head or down below and after only three days my neck and shoulders were so inflamed I went to the physical therapist on Thursday for some relief. Realizing that I couldn’t continue doing this type of work with my neck in the condition it was in, I told the manager I wouldn’t be back after Christmas. I’m finding out that my mind thinks my body is much younger and in better shape than it really is. I enjoyed being with the people there and making some new friends and I really loved just being back on Southeastern’s campus even if just for a wee bit! 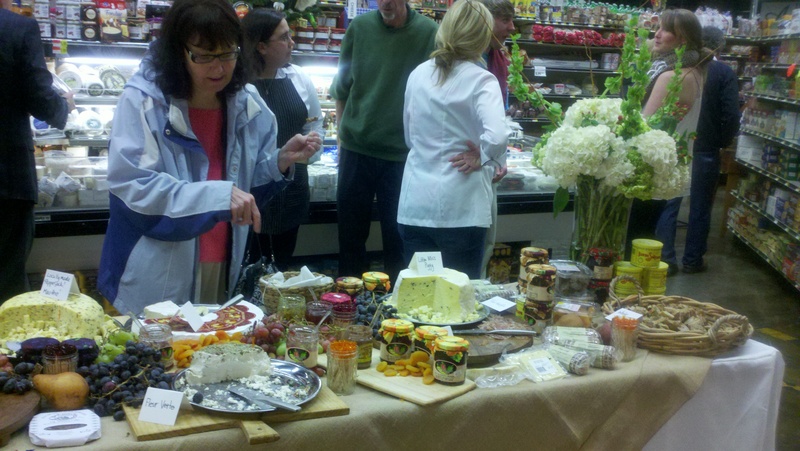 In a previous post I said we went to Acquistapace’s Grocery and how I loved their cheese section. 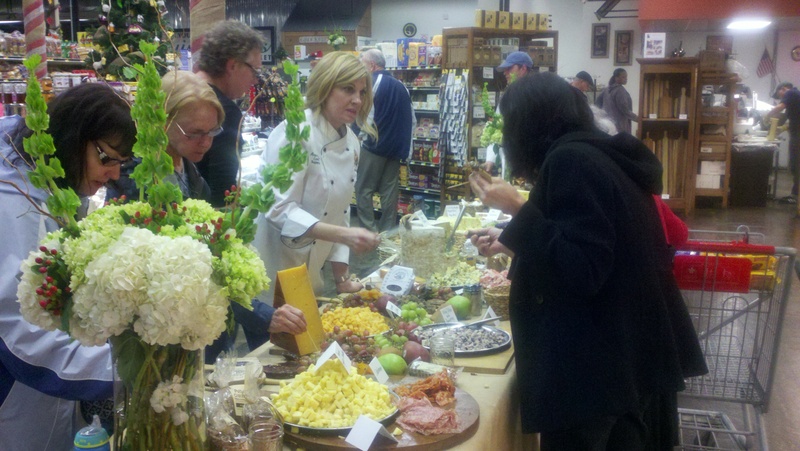 The next time we went they were having a cheese tasting with a long table filled with different cheeses to try out. 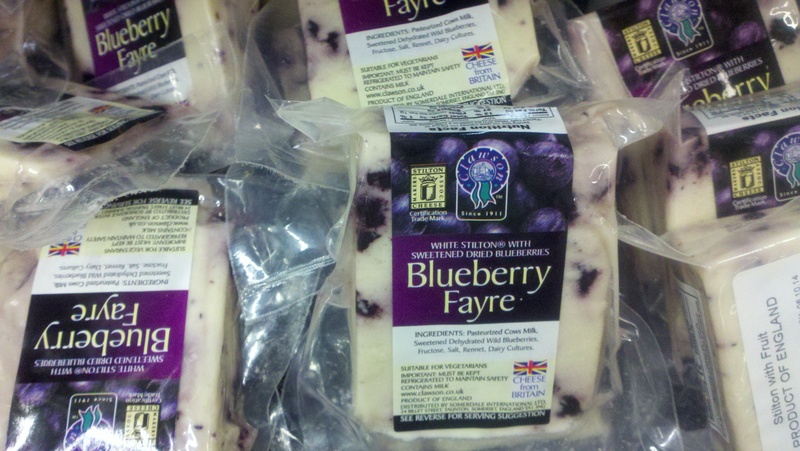 Below are pictures of that event and an up close of the blueberry cheese that was delicious! 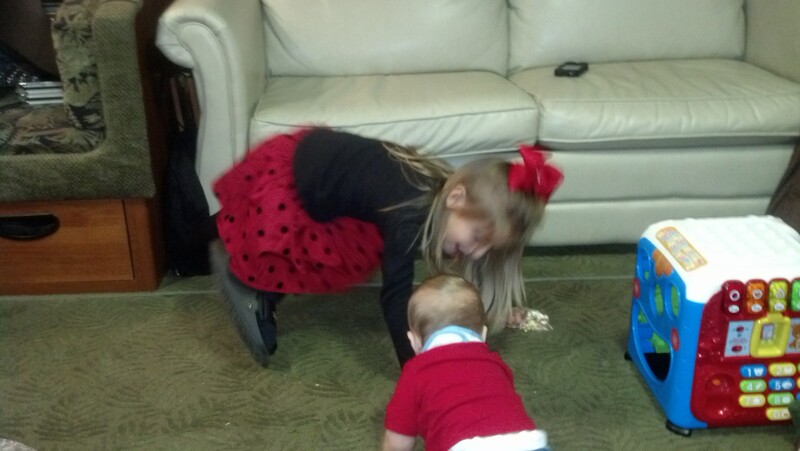 I’ll leave you with some pictures of my family Christmas with my sister’s kids and grandchildren. I am so blessed to have such a wonderful family who loves me even though they know me well! Ya’ll come back now, ya hear! 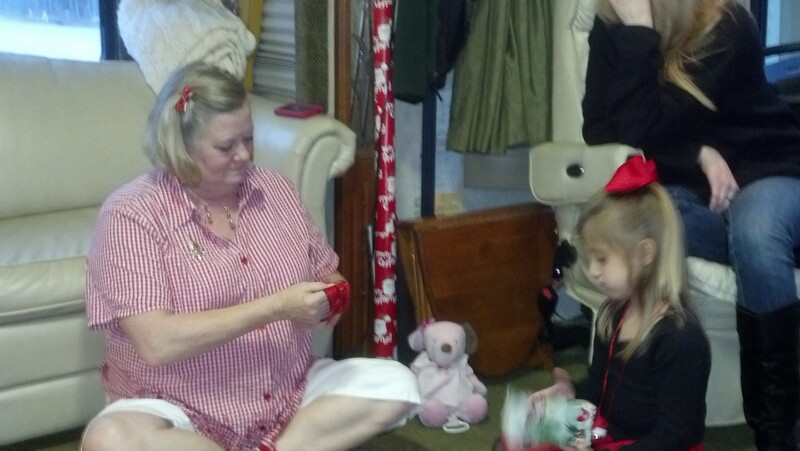 12.22.13 Family Christmas in Southern Louisiana! I think back to family Christmas gatherings when I was a child and remember the big family gatherings we had at my grandmother “Mimi”s house next door to ours. Mimi’a house seemed so big to me back then, yet when we walked through it after Katrina (when it was just a shell) I saw it wasn’t as big as I remembered. 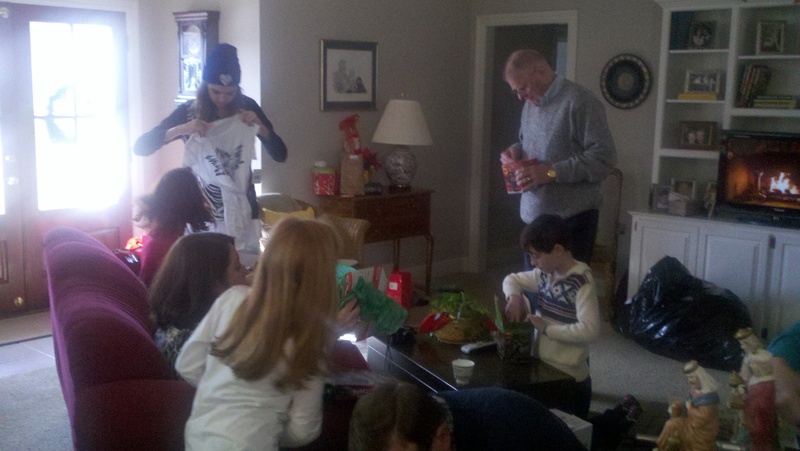 All our family gathered at Christmas and it seemed normal for her to have a shiny silver tree with a rotating light of changing colors making the tree change colors too. 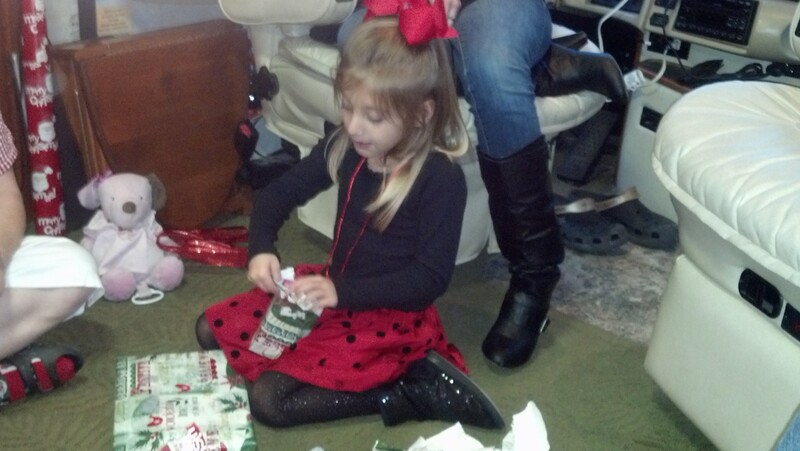 Before that I remember her having real old fashioned lights on her trees with oil bubbling up and down in the ornaments. What a fire hazard, but we knew no better and loved it. I remember every year shaving a real nutmeg to get tiny sprinkles in the cups. I didn’t know it came in a can already shaved and I love the memory of the real stuff. Some of the adult’s egg nog tasted different than what us kids got to drink and I didn’t know why until I was much older. I don’t think egg nog came in a carton back then either, it was homemade and served in a crystal bowl. 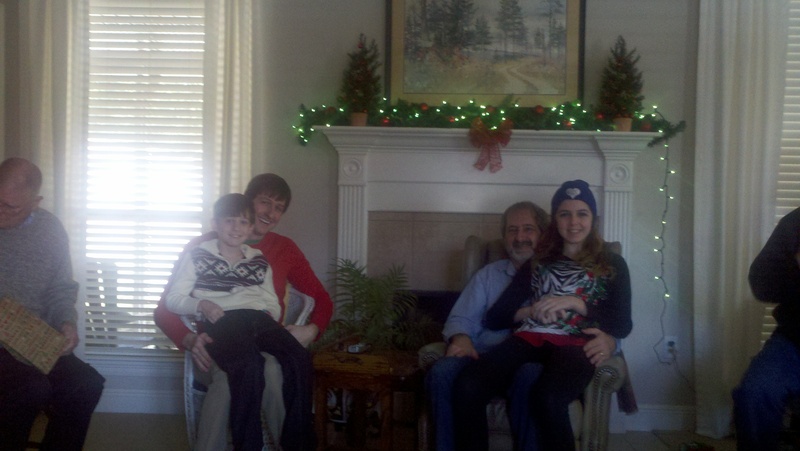 When I met Roy and got invited to the Chauvin Christmas gatherings a whole new world opened for me. 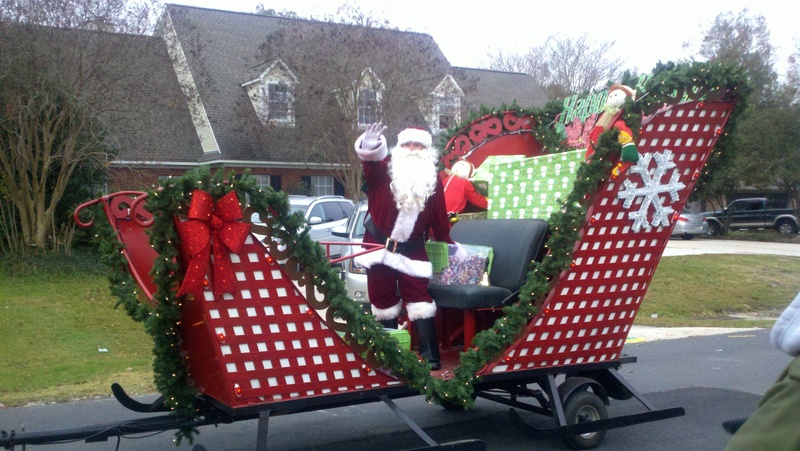 Gumbo, homemade fruit cake, lots of different cookies and candies, eggplant casserole, stuffed merlitons and more! Boy they sure knew how to lay out a spread!! 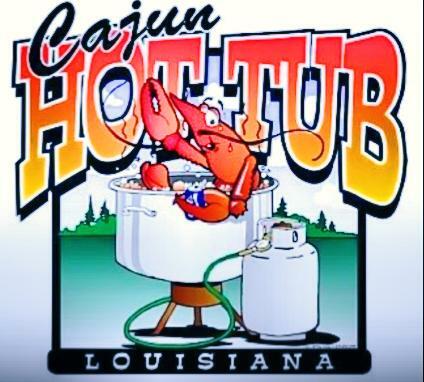 I always looked forward to seeing and tasting all that good Cajun cooking his mama did! 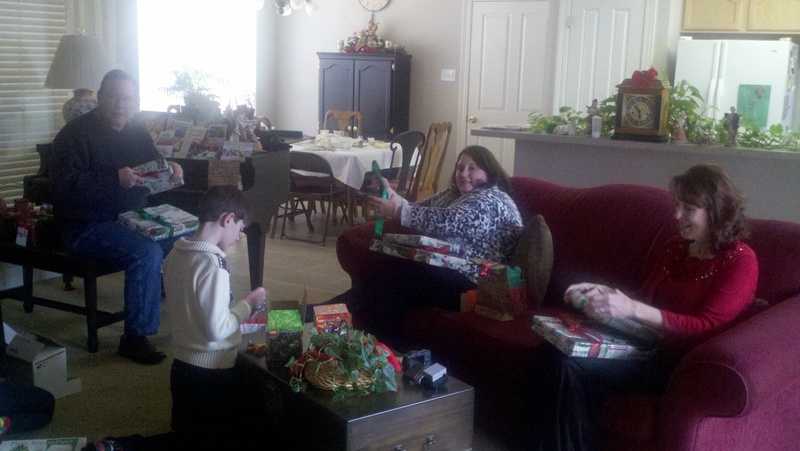 Their living room was small and I’ll always remember the floor being full of wrapping after all the children and adults opened their presents. 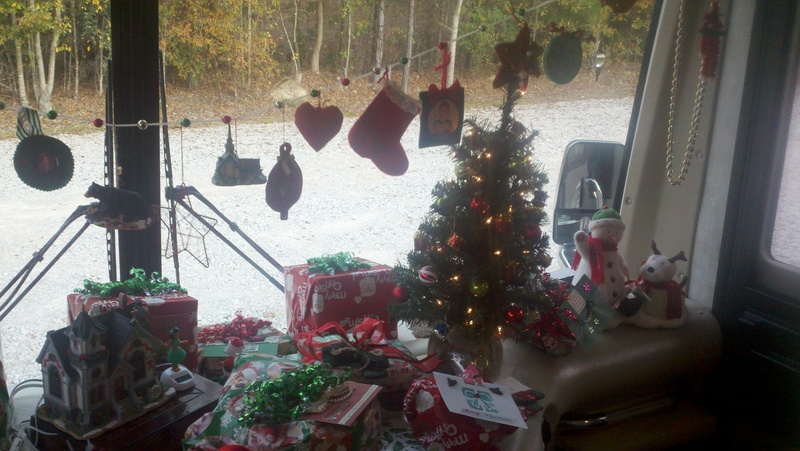 Our little home is decorated inside and out for Christmas. Might not be as much as we previously decorated in our sticks and bricks home but since we added our tiny Christmas tree I think it’s perfect! 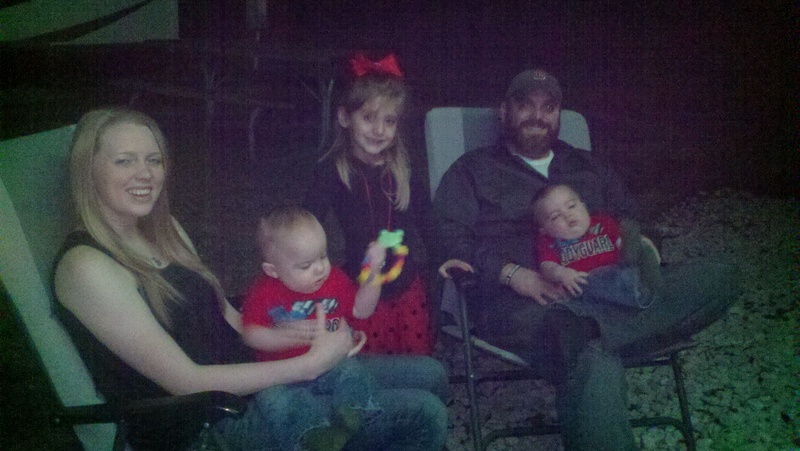 We had our family Christmas yesterday with Chip, Kimberly, Madisyn, Braxton and Bentley. I baked a turkey, sweet potato casserole, green beans and artichoke casserole and rolls. I found a Christmas king cake at Berrytown filled with bavarian cream. Delicious!! 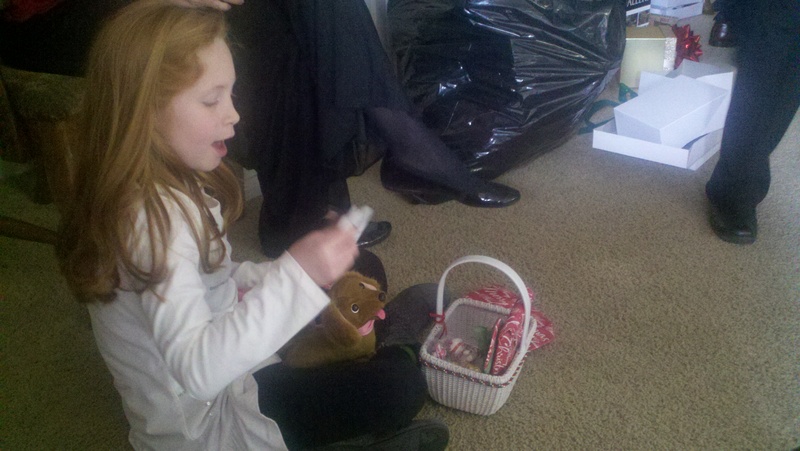 Everyone enjoyed opening their presents and Madisyn was especially pleased with the mini tablet we bought her. She’s a whiz with the computer at age 4! 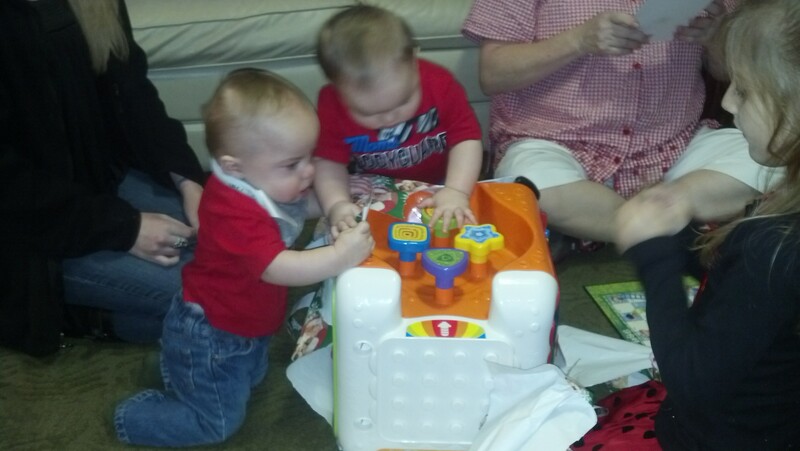 Braxton and Bentley already like their activity cube and will probably enjoy it more as they get older. 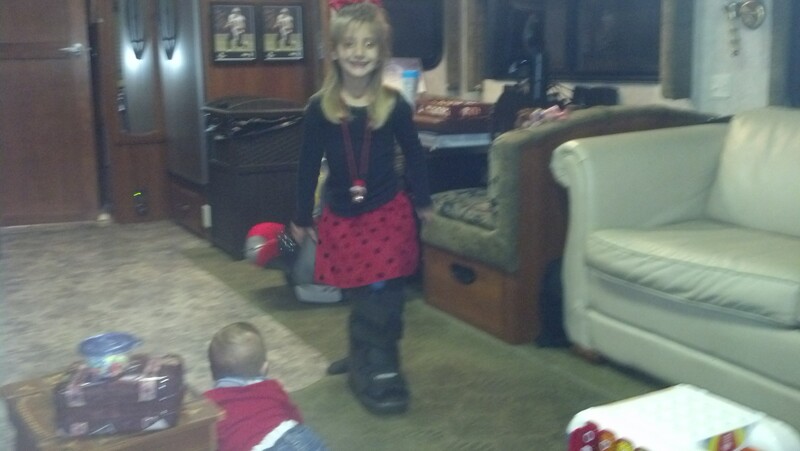 Madisyn also enjoyed putting on PawPaws big boot and it covered her whole leg! 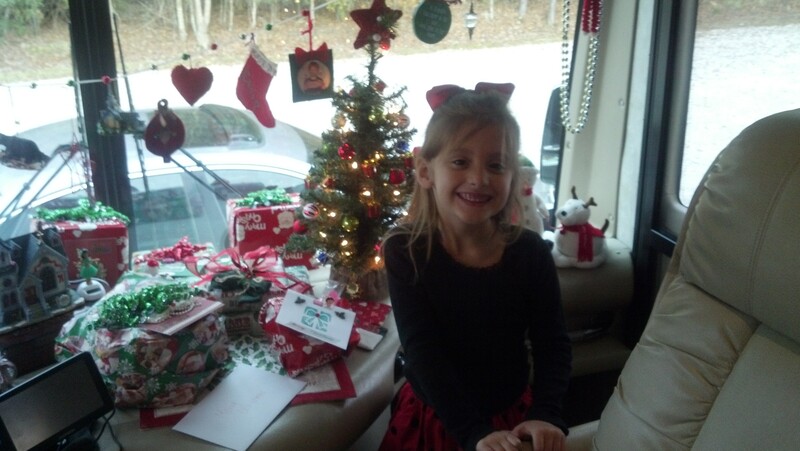 Roy and I enjoyed having them over in our little Christmas home on wheels! 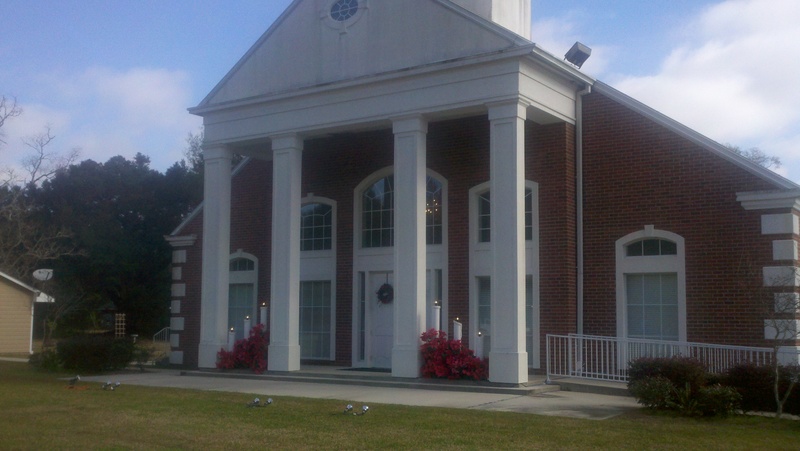 Another important aspect of our Christmas season is always the Adult Choir’s cantata at our home church, Trinity Baptist Church. 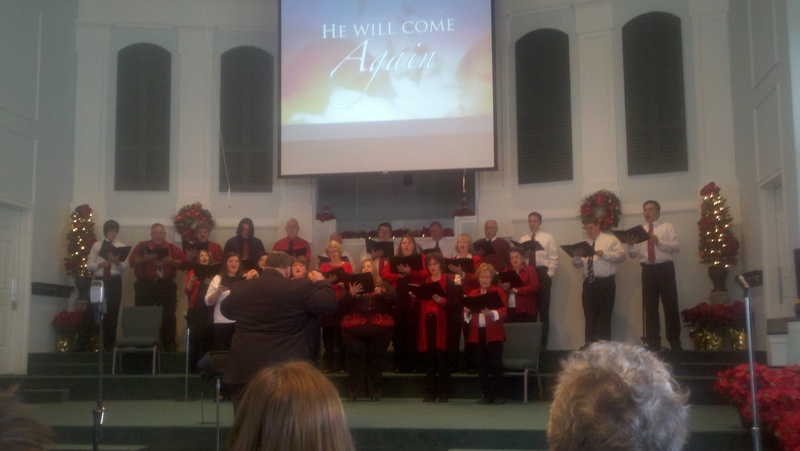 This year’s, Bethlehem Morning, was extra special for me because of the new choir members that sang. When Teddy Forrest, Mark Traylor and his sons Jonah Kyle and Mark Everett Traylor came out with the choir my heart was so happy. These are special men to me and seeing them all singing in the choir just put something right in the world! 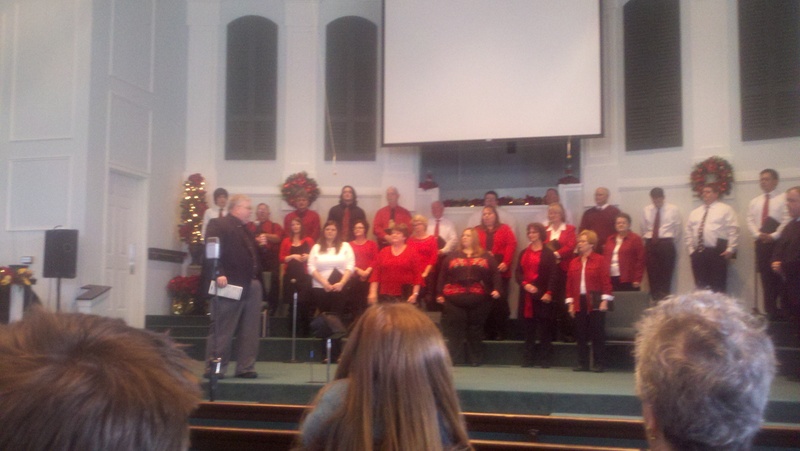 As always the choir did a beautiful job, sounding very strong, clear and every word well sung. 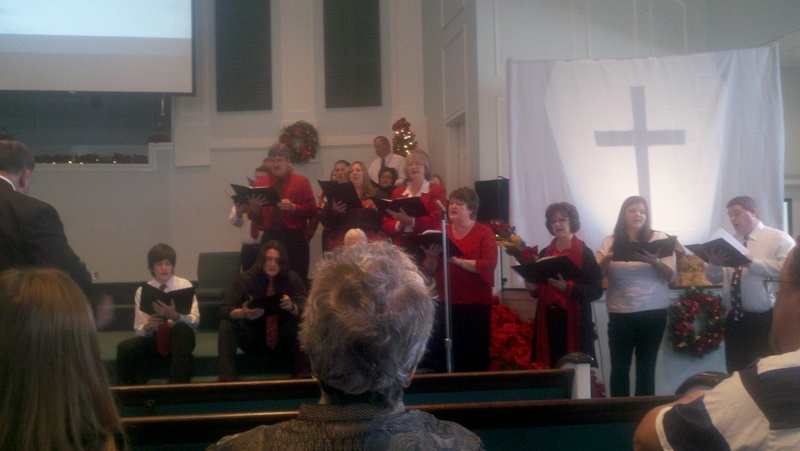 This morning was Christmas Sunday and before the sermon we were treated to a beautiful solo by Barbara Davis. Her voice is my favorite mostly because her love for Christ comes out so clearly whatever she sings plus she sings like an angel. 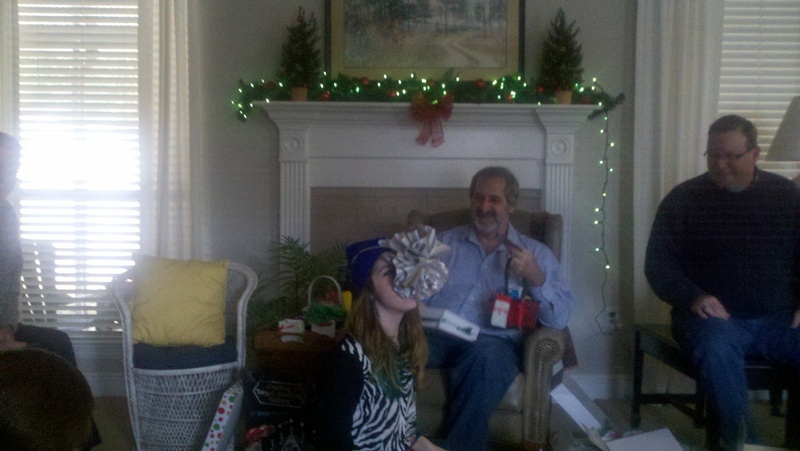 The Christmas message was exceptional. 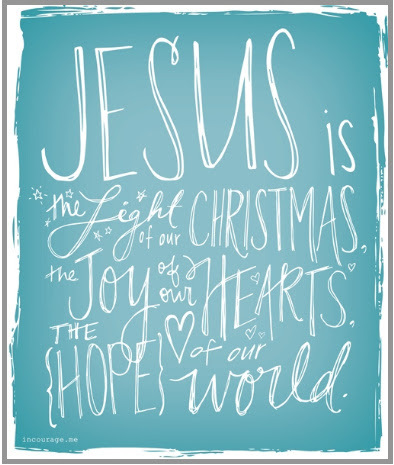 What a difficult concept it is to understand or grasp that Jesus came to earth as a human, leaving his perfect home on high to do this. That little boy who would grow up to be the Savior of mankind is overwhelming and true. 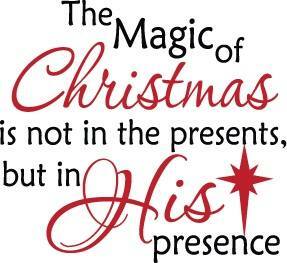 I hope you will join us in keeping Christmas about the birth of Christ and not just the presents and things we receive. 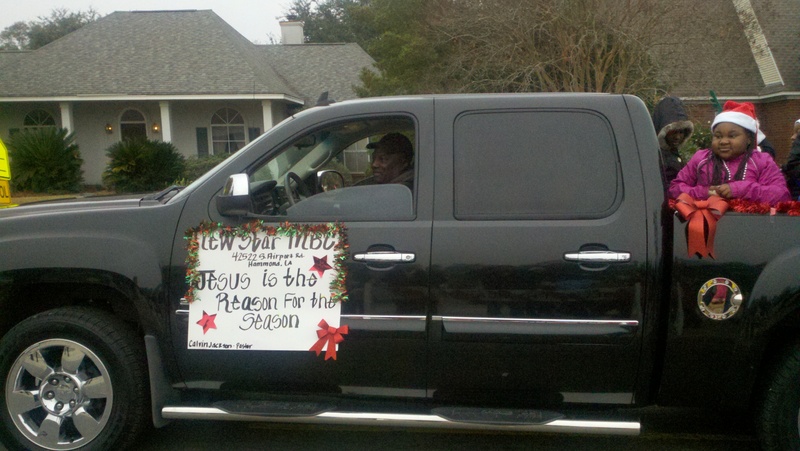 Merry Christmas everyone, and ya’ll come back now, ya’ hear! BIG DISCLAIMER: I DID NOT WRITE THIS BLOG. Click here to access the blog post. It has been a magical year for the Lions and it ended last night. I could in no way describe it like she did yet I want my followers to read about the football team of the school I graduated from, worked at and am so proud of. Ya’ll come back, ya’ hear! 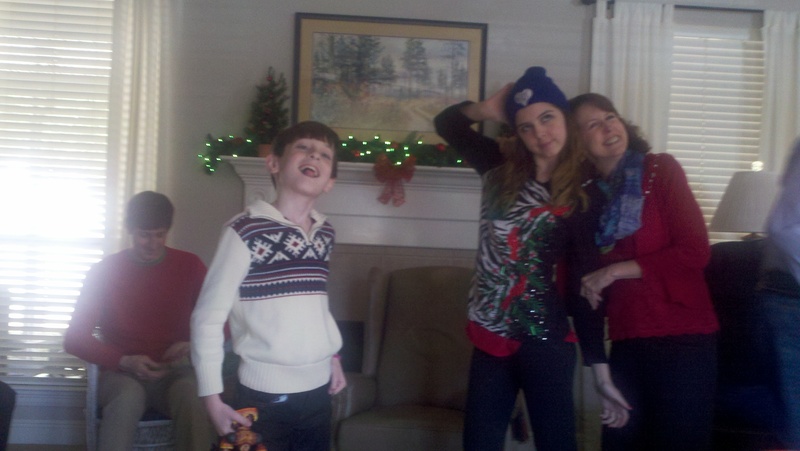 This post was written back in December when we were home in Louisiana for Christmas. I didn’t realize until now that it was never published so I’m doing that today. It may not make sense time wise in our travels but here it is!!! I said I wasn’t going to write until next week but I got to thinking (Roy always says uh oh when I say that!). I’ve posted so many pictures about things that we saw in other states so I think it’s only fair for folks that follow us from around the US to see what happens in our little corner of the country! 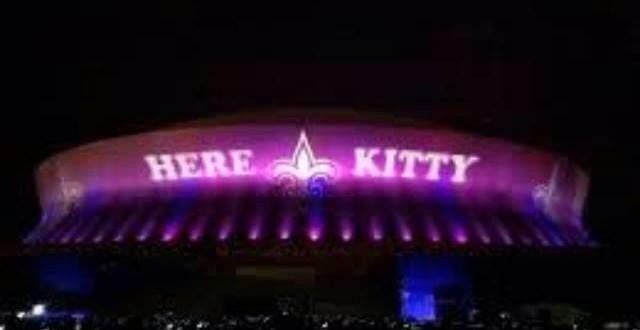 This is what the New Orleans Superdome looks like welcoming (or perhaps it’s warning) the Carolina Panthers. Had to show this, I love it! 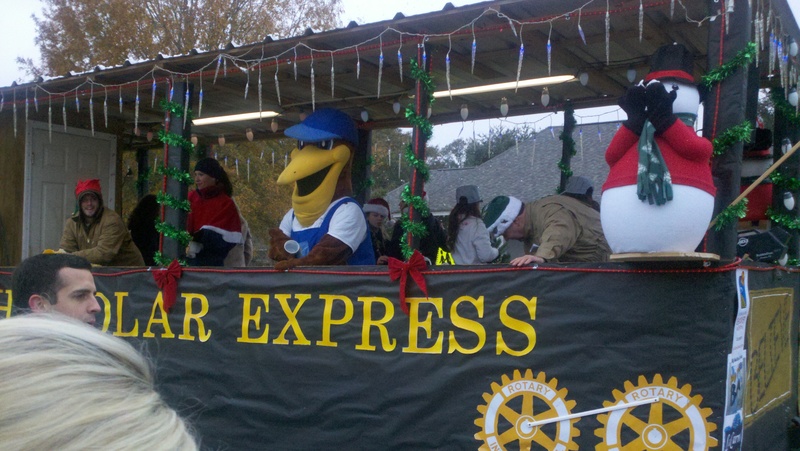 There is nothing like the spirit surrounding football in Louisiana! 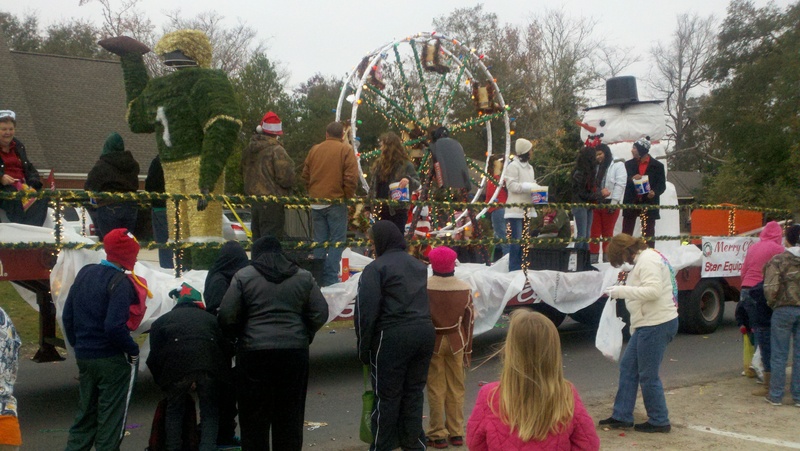 We went to the Hammond Christmas parade Saturday with Madisyn, our son Chip, his girlfriend Kim and Kim’s little boy’s Braxton and Bentley. 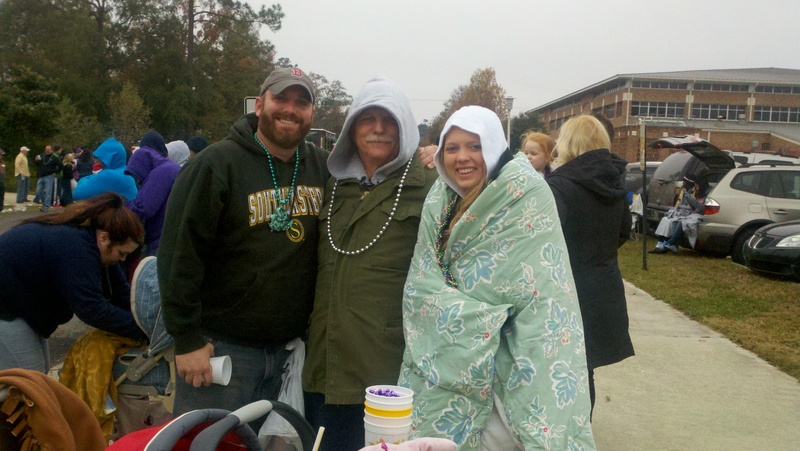 We had a wonderful time and it was between 38 to 40 degrees which for you northerners is quite, quite cold for Louisiana. 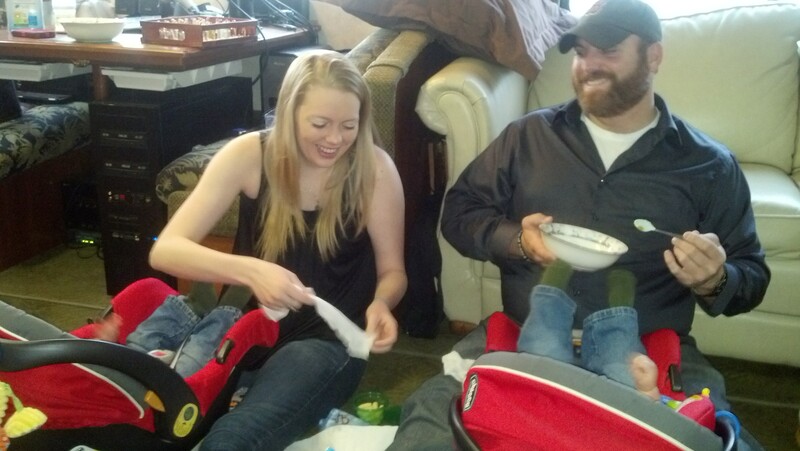 The little boys were bundled, covered and covered more to keep the cold out! 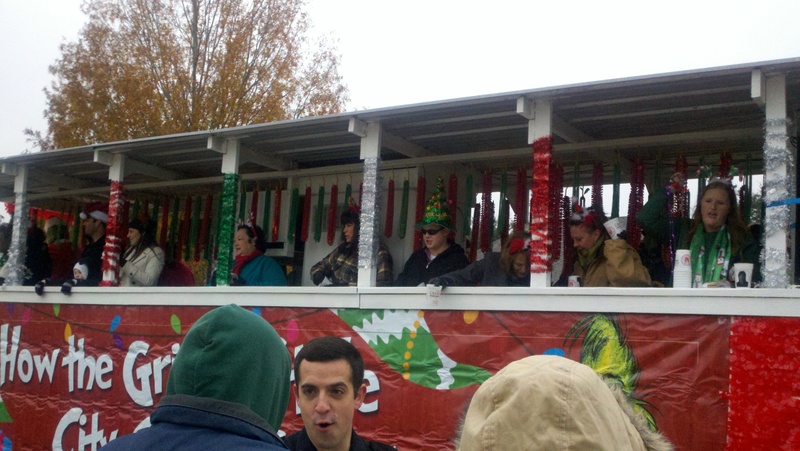 We all had many multiple layers on and still managed to catch tons of doubloons, beads, candy and cups. 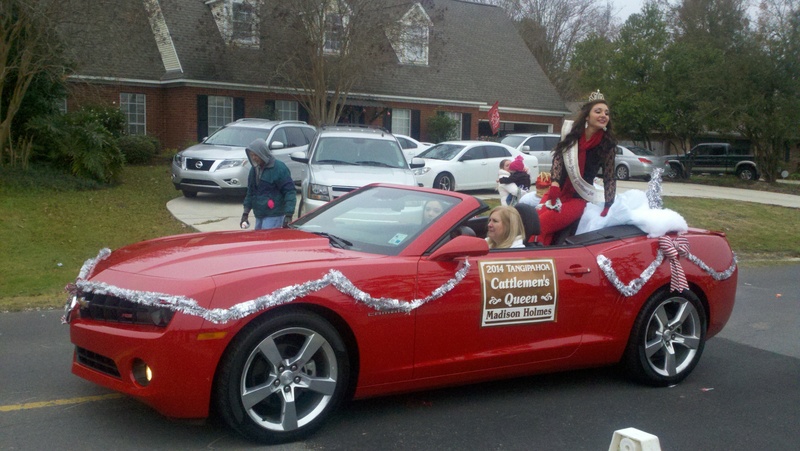 How nice it felt to go to a Louisiana parade again! There is nothing like it and to get to go to it with our family was the best! 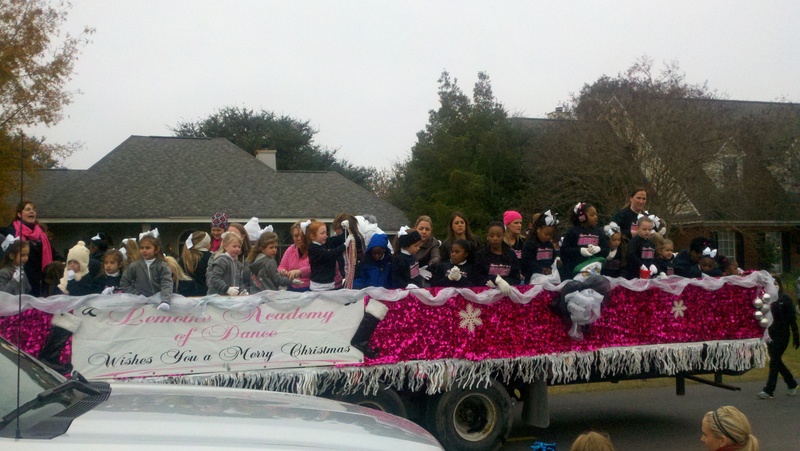 Here are some pictures from the parade. We are looking forward to attending our church Children’s Choir Christmas presentation this evening followed by the Saints in the Dome (on TV) to top off the weekend! This is a great time of year to be home. Ya’ll come back now, ya’ hear! 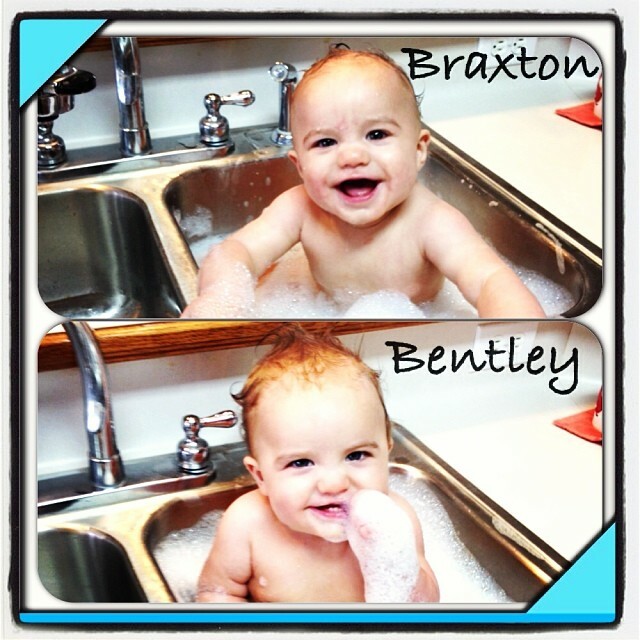 12.07.13 Being home is a blessing! The best thing about being home is that it feels like HOME! We don’t have to introduce ourselves to everyone we meet here – we hug them! No using the GPS – we know where everything is! 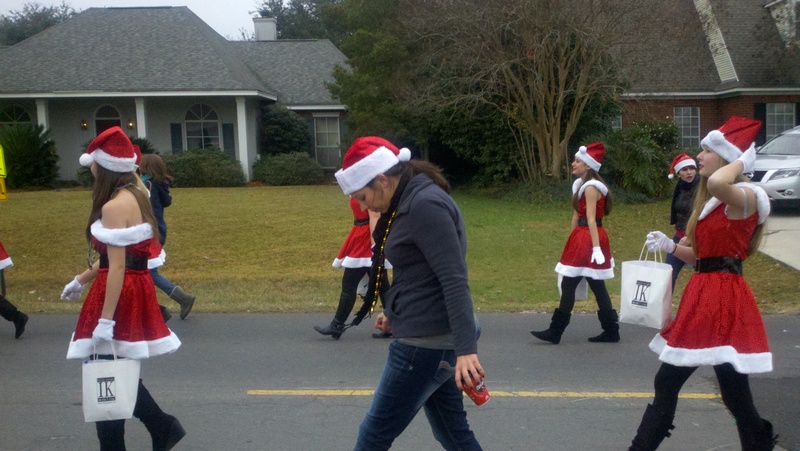 Beads, doubloons and candy was thrown at the Hammond Christmas parade this morning – that doesn’t happen elsewhere! 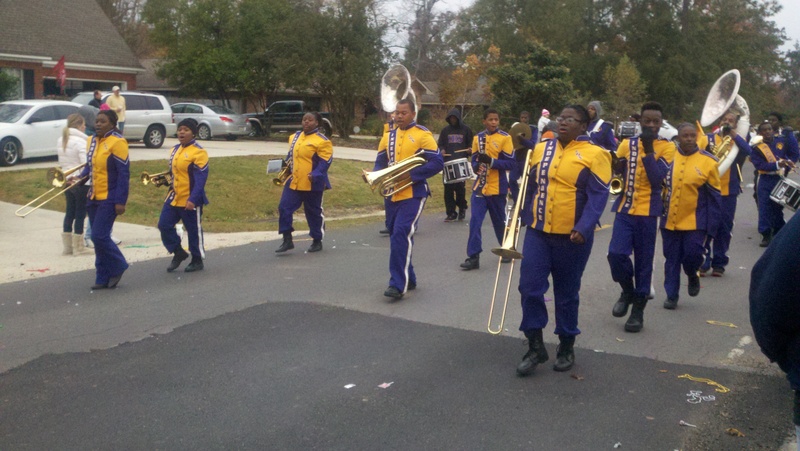 Our Southeastern Lion’s football team is winning right now in the playoffs at our own Strawberry Stadium in Hammond. We were able to buy merlitons (other states call them alligator pears and most can’t get them) to cook with pork sausage and bacon! And we were able to buy andouille sausage for our gumbo which we haven’t found anywhere else! There are fresh fruit markets and stands here unlike up north! How refreshing is that! People say ya’ll here with us instead of looking at us odd when we say it! This and lots lots more are of reasons to feel blessed to being spending the Christmas holidays here in Hammond, Louisiana. 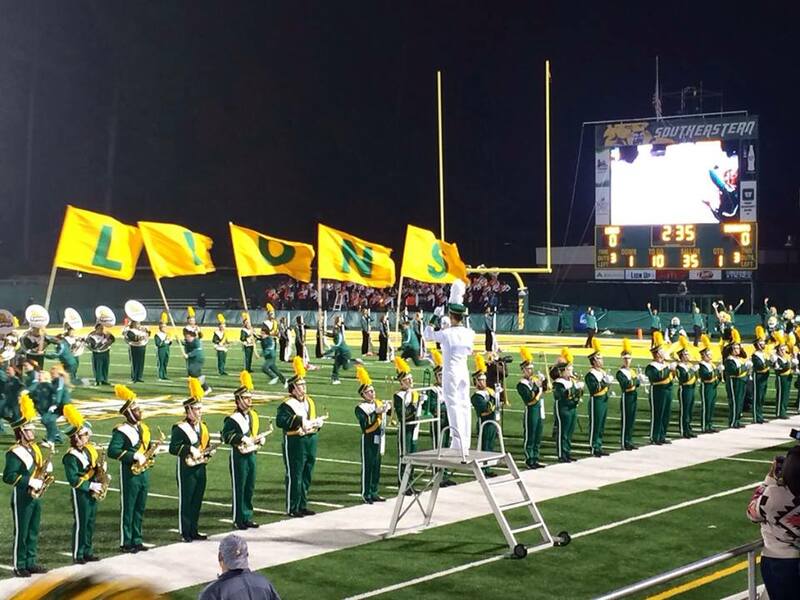 It is so very cool to be here when the Southeastern Lion’s (the university I graduated from and where Roy and I both retired from) are playing in their first playoff game at home since football came back to Southeastern several ago. We couldn’t get a ticket to this game but when they win tonight and if they play here next Saturday I plan on us being in the stands for that one! 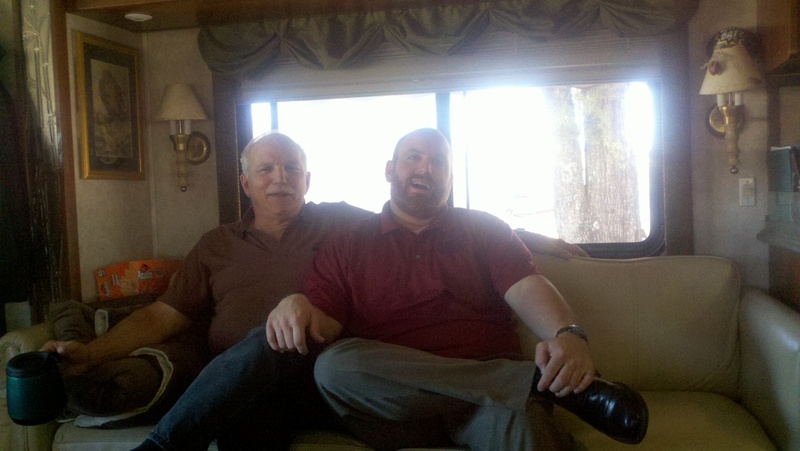 Update on our medical things: Roy’s right knee replacement surgery was scheduled for this coming Monday, but this week he was going down the steps on the RV in the dark and misjudged where the ground was and twisted his left ankle. Since he needs a well left leg and foot to be able to put weight on it when the right one is operated on he cannot have the surgery Monday and will have to wait a few weeks until his ankle heels. 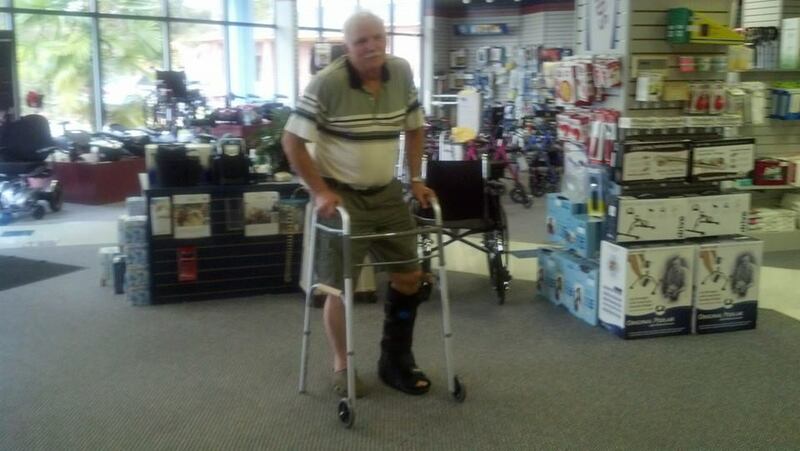 He’s in a knee high boot and using a walker right now while it heels. He goes back to Dr. Chiasson two days after Christmas if it’s not better before then. 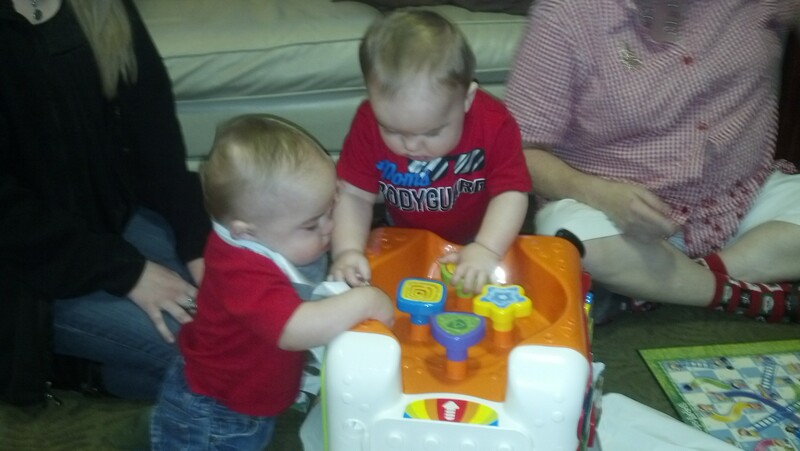 He’s doing well enough to not really need the walker right now which is (we are hoping) a good sign! This has changed all our plans about where we stay, when we leave, etc. 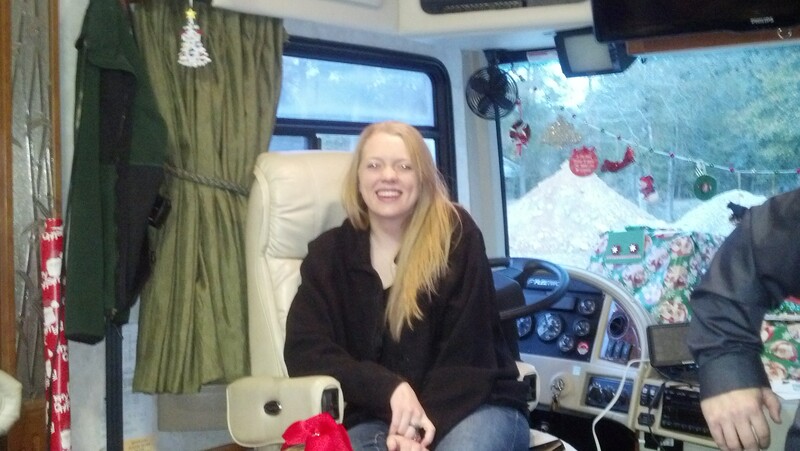 We are now staying here at Calloway RV until Monday and then going to Abita Springs to an RV park there for a week or two. When we know he is having the surgery we’ll reschedule to go to Pass Christian during his recuperation. I’d like to find a temporary job while we’re still here so we’ll see how that goes! My neck/shoulder physical therapy is going well. About half the time I feel better and half not so good. A couple of visits ago my PT, Debbie Starring, put this tape down the side of my neck, in a V shape up my arm to the shoulder and then across my back. Some of it is suppose to give the muscles support and others are suppose to inhibit something (I have real medical names for things) and it really does work. When it’s on me I hardly hurt at all which is really weird but I’m thankful for it. I go back to Dr. Chiasson next week to find out where to go from there. 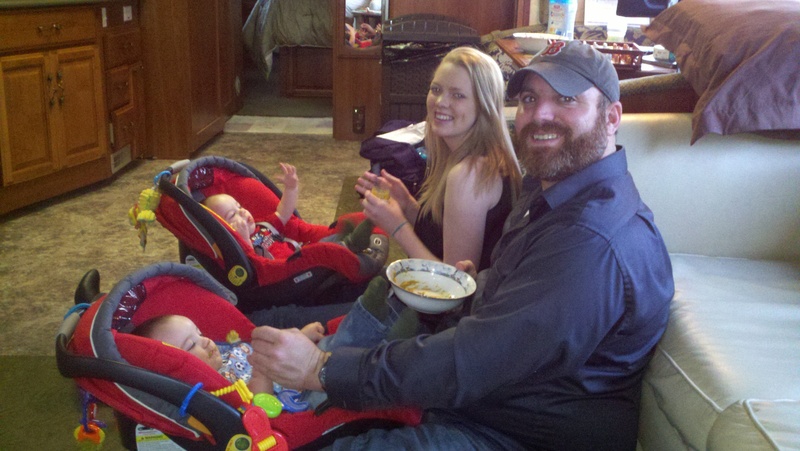 and with Chip’s girlfriend Kim and her little boy’s Braxton and Bentley! 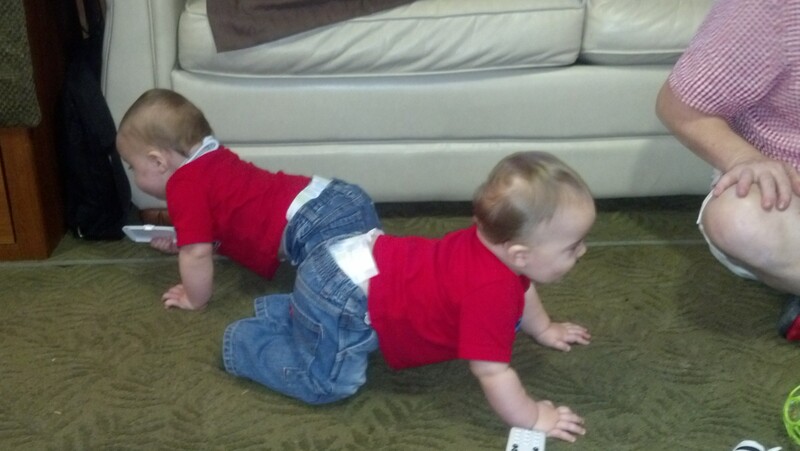 Braxton started crawling this week! I was blessed to be able to help with our home church’s garage sale today benefiting one of our youth member’s who is blind and in need of a braillex notebook to help in her school work. I taught little Emily in Sunday School when she was younger and she’s now almost a young woman and I’m so proud of her achievements in life. 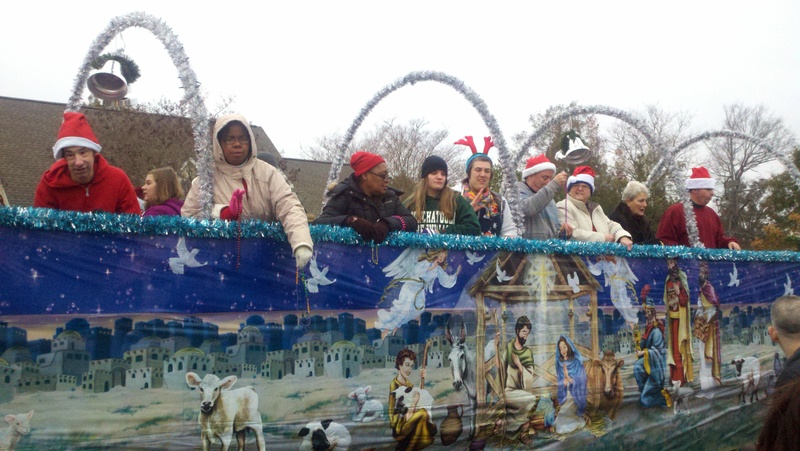 The best part was getting to visit with so many of our church members who helped out today. Ya’ll know how much I love garage sales and it was really a great time. 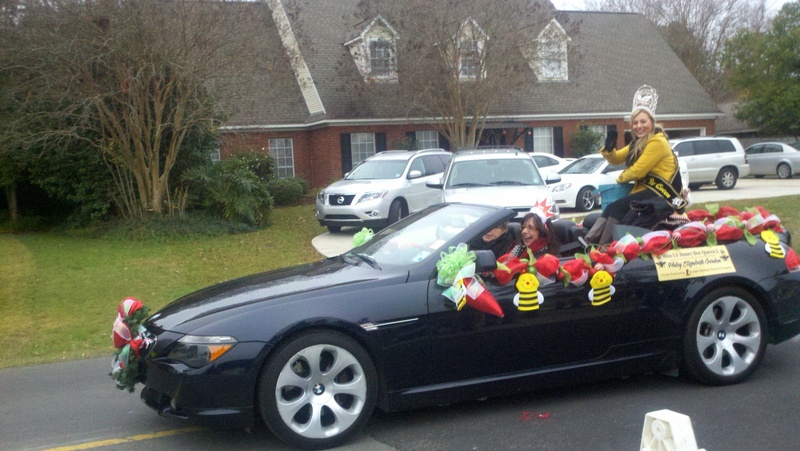 We made over $2,000 and so many people contributed their possessions and time to make this possible. 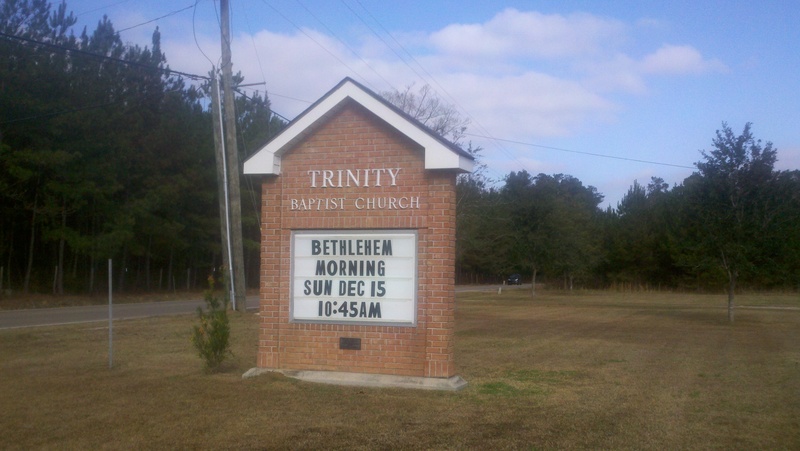 Great job Trinity doing God’s work helping others. We had Thanksgiving dinner with my sister’s family last Saturday which is always a blessing. I haven’t seen my sister since we left Louisiana in April and it was wonderful to have time to catch up plus the food was delicious and I didn’t have to cook anything! That’s a first and it was kind of nice! 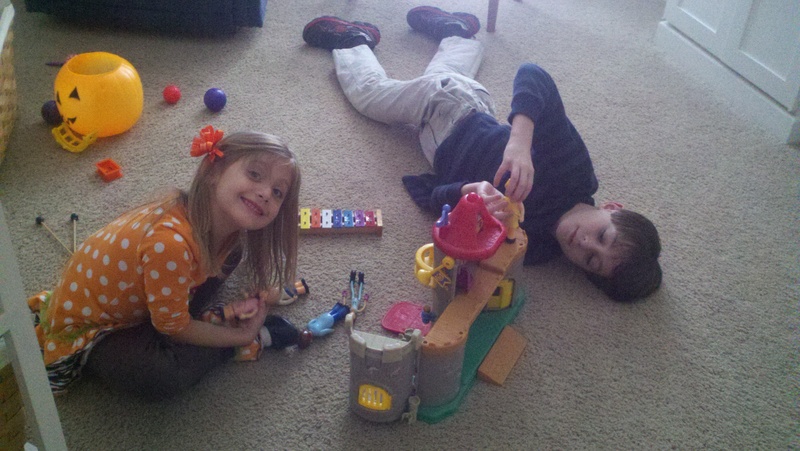 Madisyn had a wonderful time playing with her cousins and in the pictures below she’s playing with John (my niece’s son) in one and in the other she’s swinging with Sally (my nephew’s daughter). 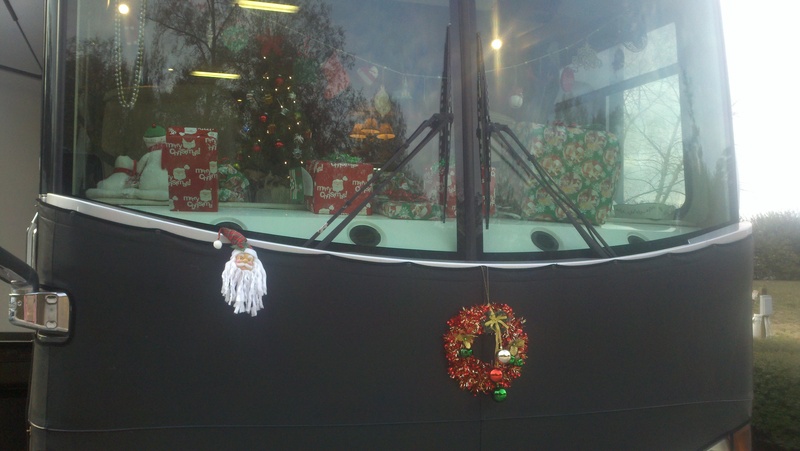 We’ll be visiting around with family between now and Christmas and are looking forward to that. Roy and I were at our family doctor’s office getting his pre-op clearance and we got a call from the RV park that they had to shut off the water to our RV because there was water flooding out from underneath Dora. As soon as we could we left and when we got back sure enough there was water everywhere outside. It turned out to be the hot water hose off the main line and had to be changed. The carpet in our bedroom (which is all of 2 feet by 7 feet) was soaking wet. Roy had to get on his back in the little space (AGAIN) and change the hose without being able to look at it with his arm over his head up in the little hole. Picture below shows him doing this. Seems like something is always happening to the washer but they are extremely expensive to replace and he’s just about replaced everything that could break so we should be good for a while! 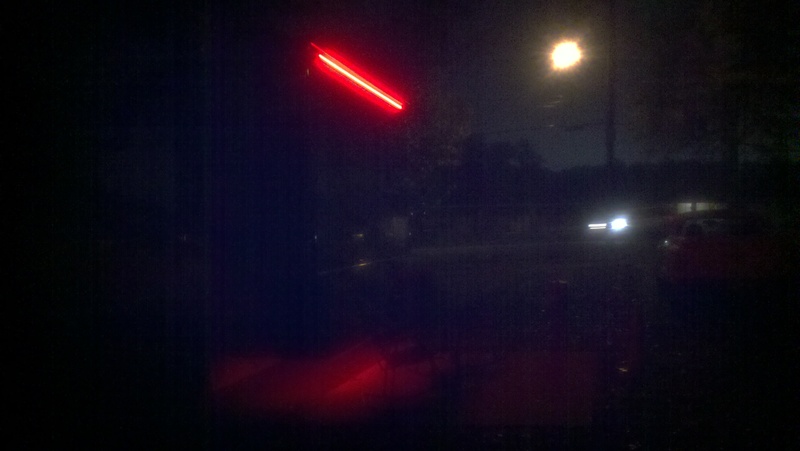 I’ll try to take more pictures of the lights at another time. Even though I was against spending the money Roy knows I think they are pretty cool! I’ll leave with this news flash: Southeastern has won their first playoff game 30-29. 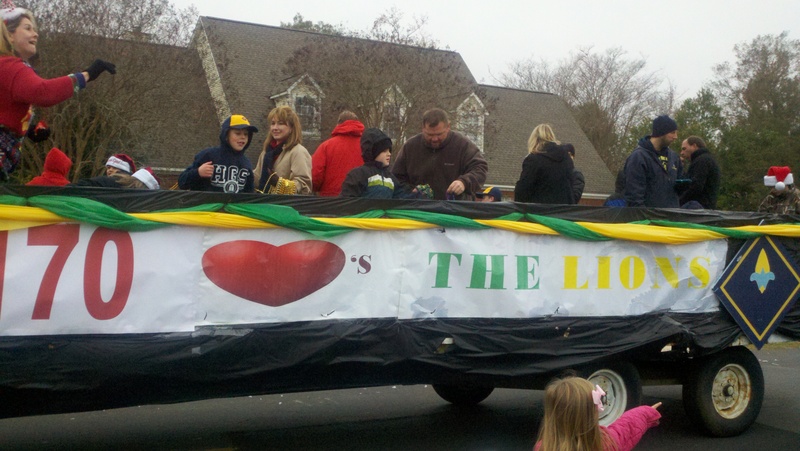 Go Lion’s!!!!! We are sooooooo very proud to be Lions and so proud of the young football players who gave us this win We play again in Strawberry Stadium for the next round! 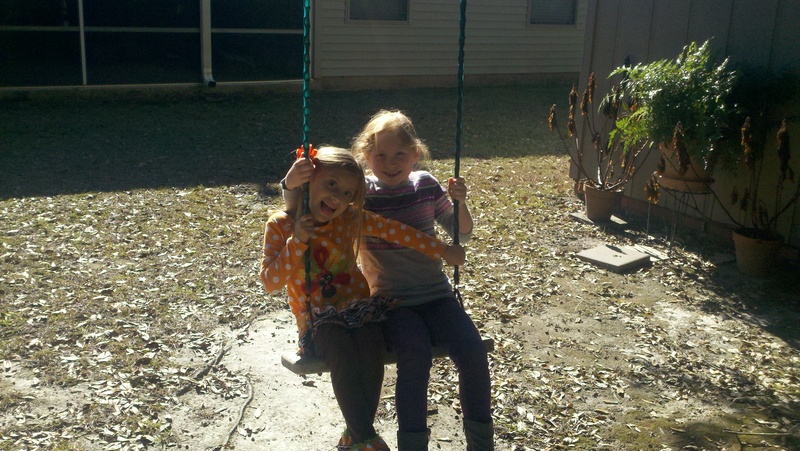 Hope you all have a wonderful weekend and I’ll let you know how we’re doing next week when we move to Abita Springs. 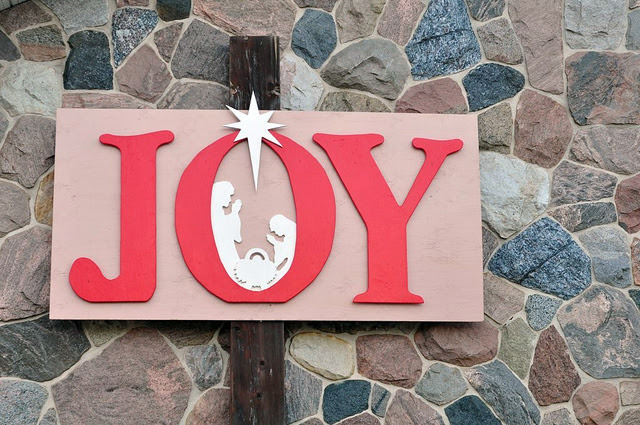 Please remember why we really celebrate Christmas and ya’ll come back now, ya’ hear!